AyurvedicYogi » New arrival at the clinic! New arrival at the clinic! Thanks to those who have got in touch to see how the birth of my second baby went. 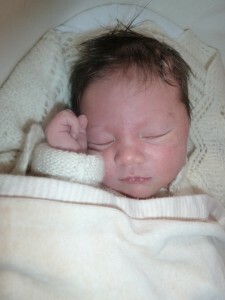 Eliza Rose Webber arrived on 7th June and is pictured here at one day old. The birth went well- 5 hours or so and she was born in the birth pool at home, in the same spot as her sister and with the same NHS midwife. Very lucky for us. All going well and she is enjoying my Shatavari laden milk I think! So much Ayurveda advice seemed to help in the run up to her birth and post natally too (such as sesame oil enemas and pichus the week before my due date, a weekly warm oil pregnancy massage, the herb bala in hot milk every evening and also shatavari to help with the milk coming in. I will be writing more on Ayurvedic pregnancy and birth care in future posts, and will end with a picture of Eliza’s first massage, when she was 3 days old.